What is one of the top 10 breakfast foods? Here’s a hint… you’re looking at it. Huffington Post puts French Toast as #10 for favorite breakfast foods. And can you blame them? 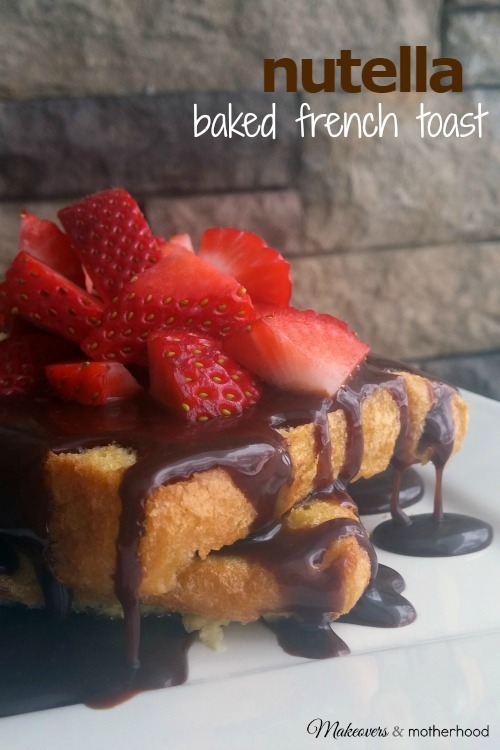 What they haven’t tried though is this chocolaty-strawberry-covered-sinfully-delicious french toast. 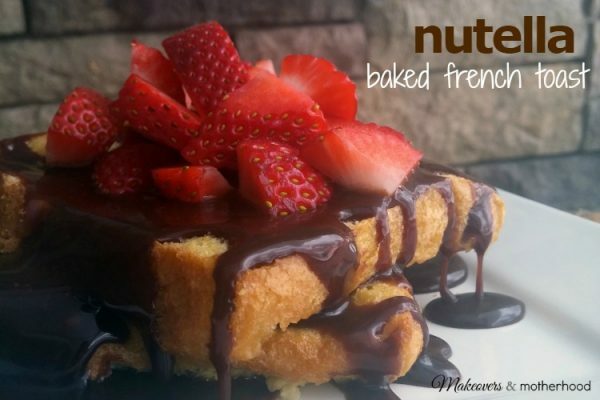 Seriously, this Nutella Baked French Toast will crush any will power you may have towards carbs or sweets and it’s worth every. single. bite.! I can’t believe I’m saying this since I try to stay away from bread and carbs, but this is one breakfast where the calories don’t count. Yes, a secret indulgence! The kind of meal where you close your eyes, open your mouth and savor each bite without guilt. Okay, I lied about the no guilt part. You may want to head to the gym afterwards (if you need extra motivation, here are 11 other reasons to go). But I’ll tell ya, this will be the best most delicious way to start your day! You’re welcome! Spray a cookie sheet (with sides) or glass baking dish with cooking spray. Lay the bread flat on the pan with the sides touching. Beat egg, milk, and vanilla until well blended. Pour half of mixture over bread. Turn each slice over and pour the rest of the mixture over the top. Bake the french toast until it is puffed and golden, about 30 to 35 minutes. With about 5 minutes of time left on the french toast, heat maple syrup in a small sauce pan on stove. After removing french toast from the oven, plate it and with a spoon drizzle Nutella syrup over it. Top with sliced strawberries and serve. The Nutella syrup goes a long way so add sparingly by the spoonful.